Every year we hope for a brood or two of bluebirds. We have two houses for them, but each year other birds take up residence in at least one of them. I shared in Spring in the Garden and Babies Too that this spring chickadees had claimed one of the houses, and yesterday I noticed there was a lot of activity going on. Thinking the babies must be leaving the nest, I went to get my camera. and when checking the exposure I noticed nature was needing a hand. This chickadee was in distress. I quickly put my camera down and went over to the house where this poor chickadee was trying to leave the nest, as all the other babies had done, but couldn't. It appeared as though his leg was caught in some of the nesting material which was too large to come through the hole, so he was dangling. 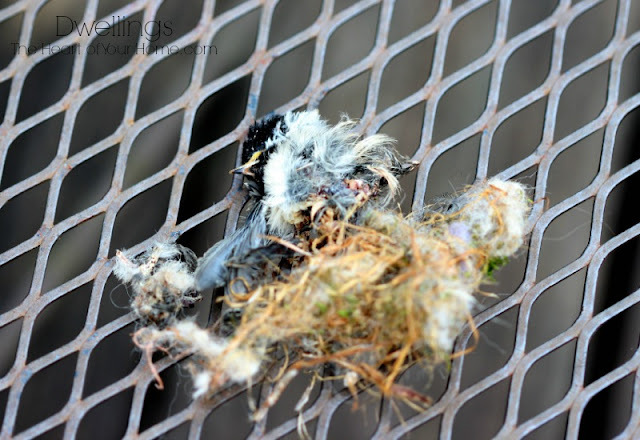 I was able to take hold of the chickadee and pull the material through the hole. Asking for my mister's help, I waited on the porch until he got there. 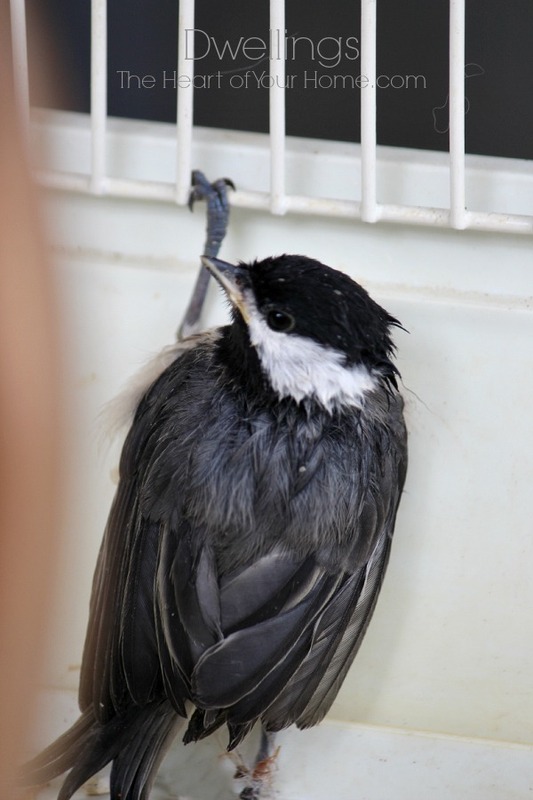 As we gently used scissors to slowly remove the material attached to this chickadee's leg we were able to see what had happened. One of the babies had not survived and somehow this birds leg was caught in with the dead baby chick and nesting material. His leg had deteriorated and he now had just a stub for a leg, no claw. My mister lovingly held the baby bird while I went to get a small bird cage from the garage. If the chickadee just been caught in nesting material and had both legs, I would have placed him back in the house. His mother would have continued to take care of him, teaching him how to leave the nest and get food. However, with only one leg and unable to fly we were concerned he wouldn't make it. We placed the baby chickadee in the birdcage where he awkwardly fluttered about, being weighed down by the hanging leg with no claw. Soon he was able to take hold of the cage ledge with his good leg while the other was dangling down. You can still see a bit of the nesting material still on the dangling leg, we didn't want to cut too close. We support a locally owned shop, Backyard Wild, for all of our bird seed, houses, hummingbird feeders, and other bird supplies. 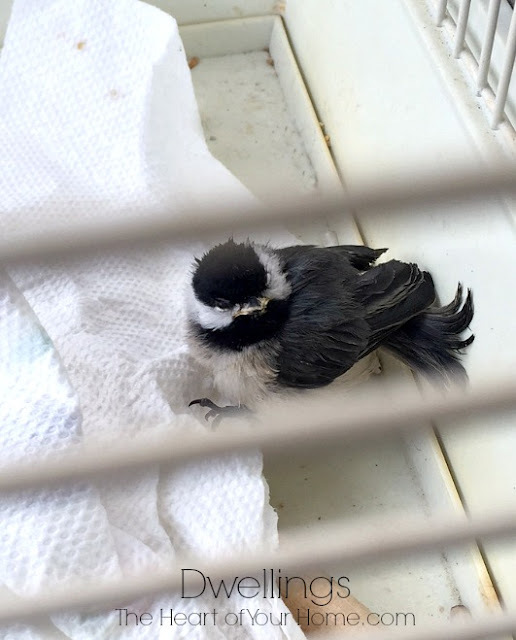 I called them to ask about how to care for this baby bird and they gave me a few numbers of local bird rescue facilities and one was able to take the chickadee. Here he is while on the way to the rescue center, he was beginning to use the partial leg to stabilize his other side, I was so happy to see that! He was also singing to me from time to time, precious bird! 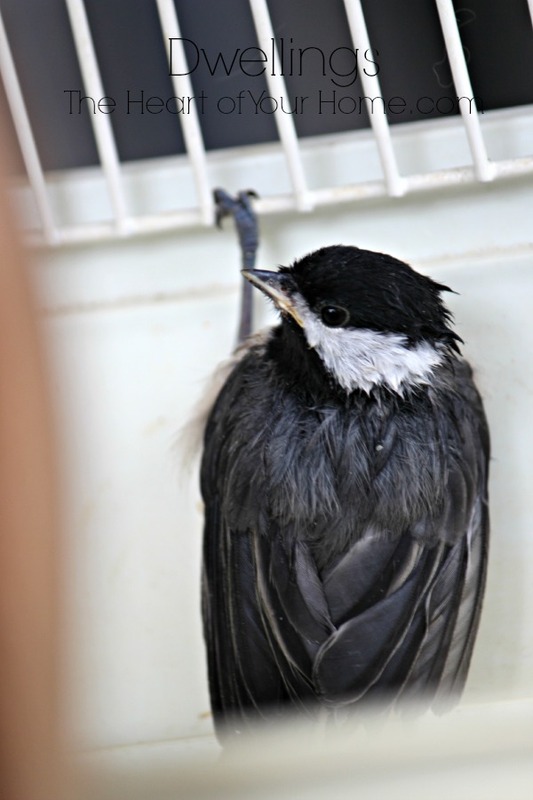 Your local bird store or veterinarian is a good resource for rescue facilities. Momma birds will always try to care for their babies, if they are still alive to do so. If a nest has fallen from a tree and the babies are still small, you can try to put the nest back in the tree. 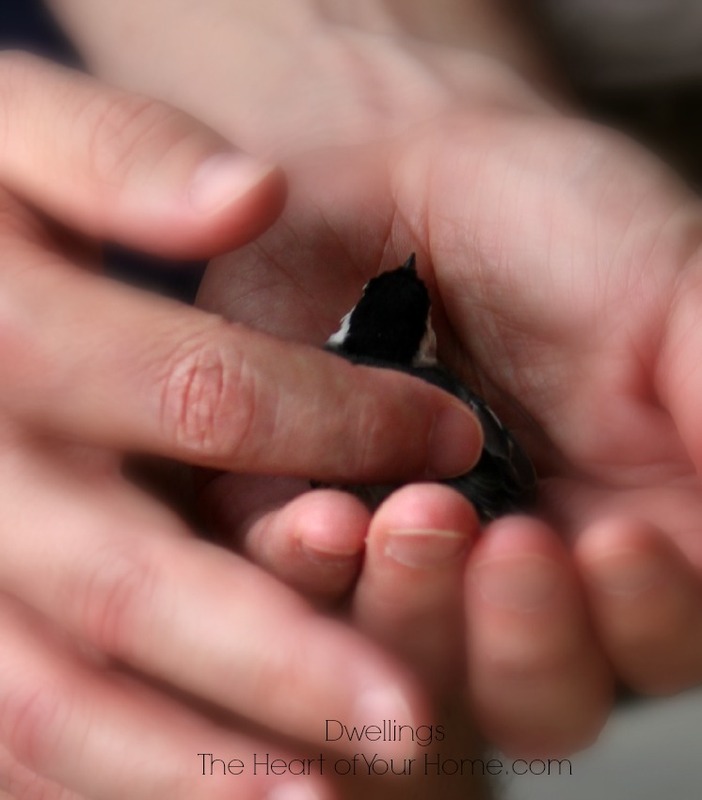 If you feel it is unstable, you can do as we did here in A Catbird Rescue. If you see a nest full of eggs or small babies and you don't think the mother is returning to care for them, place some dental floss across the eggs or something soft like a large leaf in the house opening and come back in a bit to check it. 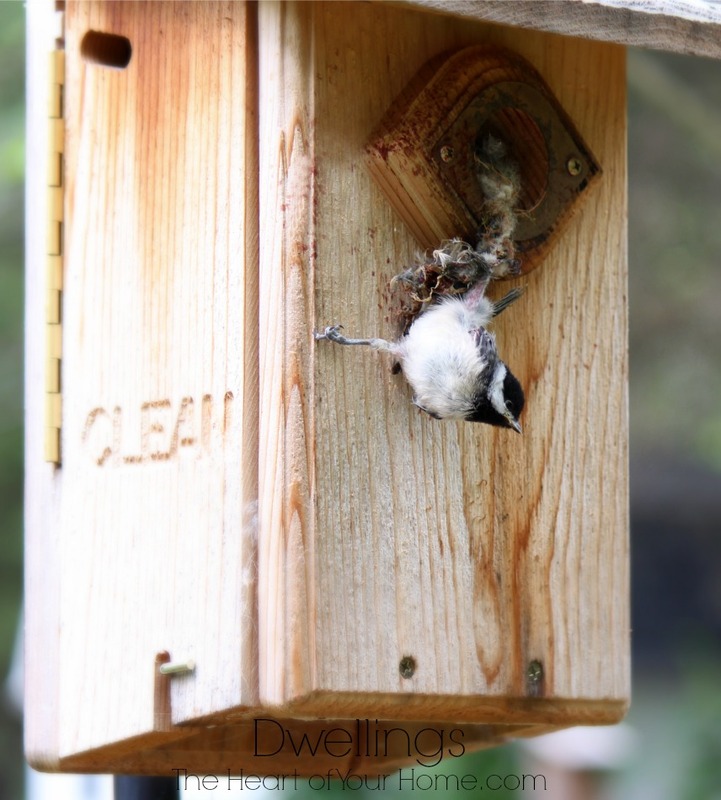 If the mom is tending to the nest, she will remove or move the dental floss or leaf from the nest or house opening. If the babies have hatched and she isn't returning, call a rescue facility. If you notice a baby bird hopping on the ground or on a low branch, leave it alone if you see the momma still tending to it. Even if the baby bird has very few feathers, she will take care of her baby. If the baby is able to get up off the ground on its own, that's good. 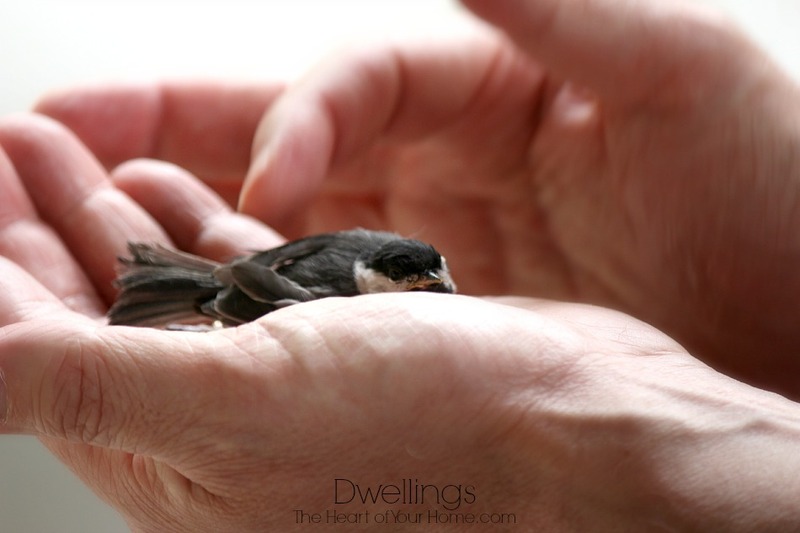 If after watching the baby bird for a while you know there is no mother tending to the baby bird, move to a safe place like a small bird cage or small cardboard box with a soft cloth over the top and call a rescue facility. However, if a small bird is on the ground and is unable to us its wings and unable to hop up on a low bush or branch, keep an eye on the baby and call a rescue facility. Even if the mother is still close by, a baby unable to use its wings is at risk. Ask the folks at the resource center what to do and go from there. This is the momma bird. This picture was taken back when she had just taken up residence in the bluebird house and five eggs were in the nest. I hope she knows we've done all we can to care for her baby. Sometimes nature needs a helping hand. Do you have a story to share? Oh Cindy, that is the sweetest story ever! Poor little bird. So glad you came to its rescue! What a super sweet story. Glad you could help the momma in distress, not to mention the baby bird. What a beautiful story - thanks for being so kind to our birds. I always feed and keep watch on any bird nests in my yard. Had one wren's nest on my patio and she had 2 babies and I could sit in the living room and watch her and dad keep a close eye on them, feeding and caring for them. It was fun to watch her teaching them how to fly and the next day they were gone. This is the second year that they have had a nest there. My hummers keep me busy feeding them and making their food. Have a wonderful weekend and Happy Mothers Day. so glad you saw him Cindy, these kind of things just break my heart. I am glad to hear that the baby could be helped. One year my hubby and I were walking our dogs and a cat was crouching low near some tall grass in front of a house. When we got closer we could see a female duck sitting there that couldn't move very well or fly away. I shooed the cat away while my hubby went back to our house to get a towel and a cardboard box to put the duck in. We took her to our house and I called a few places and only one would take her. Of course it had to be about an hour and half drive away but I took her there anyway and also left a donation. It makes me feel good that I can help out another one of God's creatures. What a sweet story Cindy! I am so happy you were able to help him! Poor Baby. I'm relieved to hear you were observant and ready and able to help! Kudos! So sweet! I can't remember a time we've ever had an occasion to "come to the rescue." But, we have bluebird houses both at this house and the new house. Happy Mother's Day!!!! You are so very sweet...it takes a big heart to do what you have done. Maybe it's our area, but most rescue centers in our area will not take "common" birds or wildlife". I know it's sad but it's all about funding I guess. And the need for taking care of endangered species. You make my heart feel so happy! What a sweet story! You did your good deed for the week! Thanks for the tips. We have lots of birds around here, and I'm looking out at the Cardinals who come to eat on my back porch every morning! This is so sweet and I hope the baby will be ok. We've rescued a few things over the years too. You always wonder what happened to the baby later. I'm glad to know your bluebird house has chickadees. They've been checking out ours too. How wonderful that you could help that baby! Great tips here too! I did not know about rescues places for birds. I was always told not to touch the babies because the mother would then abandon them. So sweet that he was singing to you. He would not have made it without your help. Just yesterday we came hoe to a dove on his back. I wasn't sure what kind of bird it was until my husband gently rolled it over with his shoe. Poor thing. He gently moved it with his foot from the sidewalk to the flower bed. I felt so bad. he didn't look alive at all. But there was no blood or damage. We had to leave again quickly after we came home. When we came back home hours later he was gone. at first we thought maybe a cat had gotten him but I really think he was stunned. It is amazing when they do that. Aww! I love your story! 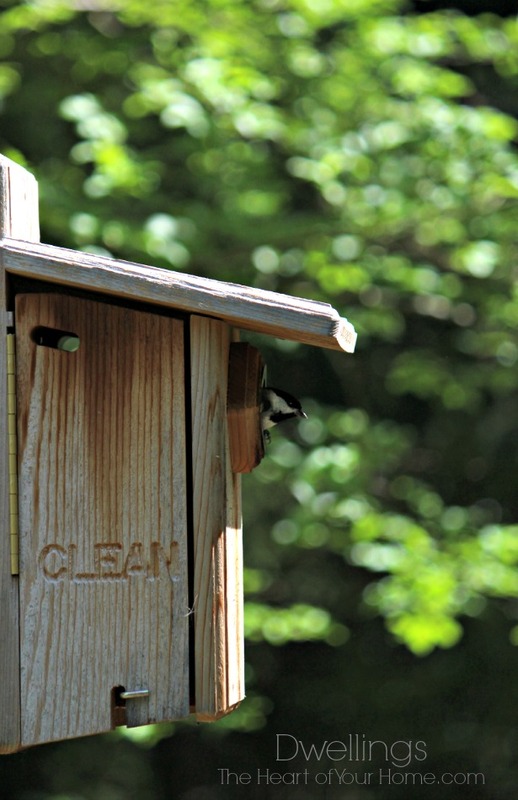 I just blogged a story about baby birds too. Fortunately, all mine were able to leave the nest safely. My website is homeonthecorner.com if you want to check it out. Thanks so much for taking time to care for this little bird! Awe Cindy poor little thing! Did he make it? I sure hope so.